2. An ice skier sliding from a height of A, as shown in the figure below. If the initial velocity = 0 and acceleration due to gravity is 10 ms-2, then what is the velocity of the skier at point B. The principle of conservation of mechanical of energy states that the initial mechanical energy = the final mechanical energy. 3. An object start to sliding from a point of A without the initial velocity. If there is no friction force, what is the velocity of the object at the lowest point. The velocity of the object at the lowest point (vt) ? Apply the principle of conservation of mechanical of energy states that the initial mechanical energy = the final mechanical energy. 4. A 2-kg ball free fall from point A, as shown in figure below (g = 10 ms-2). After arrive at point B, the kinetic energy = 2 times the potential energy. What is the height of point B above the surface of earth. When arriving at point B, the kinetic energy of ball at point B = 2 times gravitational potential energy at point B. Substitute v2 at above equation with v2 at this equation. 5. A 1-kg ball is released and slides down from point A to point C, as shown in figure below. If the acceleration due to gravity = 10 m.s-2, what is the kinetic energy of ball when arrive at point C.
Kinetic energy of ball at point C = 7.5 Joule. 6. 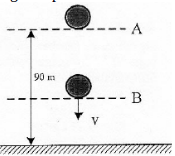 A 2-kg ball is released from point A, as shown in figure below. The curve plane is smooth. If the acceleration due to gravity is 10 m.s-2, what is the kinetic energy of ball at point B. 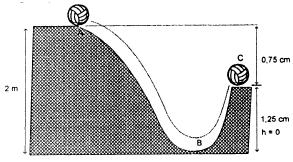 Kinetic energy (KE) of ball at point C = 24 Joule. Kinetic energy is getting bigger means the velocity of the object is getting bigger and the gravitational potential energy is smaller means that the height of the object from the soil surface is smaller. This happens when the object moves from a certain height down to the ground.